Welcome. I know you’ve had a busy few months, filling mouths and jam jars and making appearances at countless local festivals on your annual (and no doubt tiring) trek north, but I want to thank you all the same for stopping here and spending some time with us in Germany. We had one hell of a winter, and not too nice of a spring either, so your little sweet scarlet orbs of sunshine are really just what the doctor ordered – or would be if doctors here were in the habit of prescribing fruit (which I actually think they should be, but that’s a discussion for another time). If you want to know the truth, there were times when it was just the promise of your visit that got me out of bed in the morning, particularly when, day after day, the only things to be found in the markets were every bit as drab and colorless as the winter landscape. I know that some people got so desperate they even fell victim to the temptations of your early-season impostors, you know, your monstrous white-shouldered cousins that fly in before you each year from places like Spain and Morocco where they seemingly like to grow things without flavor. But not me; I knew it was worth waiting for you, and even when you failed to arrive on schedule a couple of weeks ago, I knew you’d come eventually. You always do. Anyhow, since I’m so happy to see you and want to give you the welcome you deserve, here’s what I propose. For as long as you decide to stay – which I’m hoping will be a while, particularly when you see what I have planned – I will put you into as many of these pies as I’m physically able to make, and we’re physically able to eat. Sound good? It should, since this pie is just about the best thing to come along since sliced bread. On second thought, it’s better, since I’ve never woken up in the middle of the night consumed by cravings for a well-cut loaf. This pie, on the other hand, I can scarcely stop thinking about, particularly when there’s just one slice left in the fridge and I can’t shake the nagging fear that someone else may finish it off before I do. But let me tell you about this pie: it respects you. You know how so many desserts that feature you end up turning you into a cloyingly sweet heap of cellulose? Not this one. It keeps you fresh and intact, your exquisite flavor – and your dignity – preserved. The trick, it seems, is in not cooking you. In fact, you’re not even warmed in the making of this pie – though to be fair your juices are, after being gently extracted and combined with just enough gelatin to give you a wobbly-soft cushion to relax on when you’re spooned into the crunchy shortbread crust. And speaking of the crust, it’s a marvel in itself, though don’t worry about it stealing the limelight – it’s only there to play backup. Really, this pie is all about you. For a change, you’re not an accompaniment, you’re not even a component (like you are when you hang out with your old pal shortcake): you are the dessert. I know it’s a strange concept and probably one you’re not too familiar with, but trust me, it works – and better than you can possibly imagine. I can’t really take the credit for this pie, though. For that you have to thank a certain lady at a sadly-defunct magazine. I did, however, refine her recipe somewhat in ways I thought would serve you better. I gave you a slightly sturdier crust, for one thing, so you’d have plenty of support when you were transported from pan to plate. More importantly, I tried to minimize the amount you’d be diluted, extracting juices from all of you rather than just a select few, and cutting you slightly larger so that you’d retain your integrity even despite having given up your lifeblood for the better good of the pie. I also made sure you’d never come in contact with anything warmer than room temperature, again so as to not threaten your delicate constitution. I think the fiddling worked: in this form you’re not only the best strawberry pie I’ve ever eaten, you’re one of the best fruit desserts of any type. And even my husband agrees you don’t come much better than this, despite being a much more equal-opportunity strawberry-lover than me (he even likes you cooked! I know!). So, my dear strawberries, there you have it. I may not be able to welcome you with the kind of trumpets and fanfare you encounter elsewhere around the globe, but I promise, once you step into this pie you’ll be met with a rare and special kind of reverence. You’ll no doubt win some new fans, and I daresay you’ll even leave those cherries and plums awfully big shoes to fill when they arrogantly breeze through later in the summer. And if I could ask just one small thing in return, I mean apart from everything else you give so selflessly, it’s this: would you consider scheduling us just a little bit earlier next spring? A year will be such an agonizingly long time to wait for another slice of this pie. 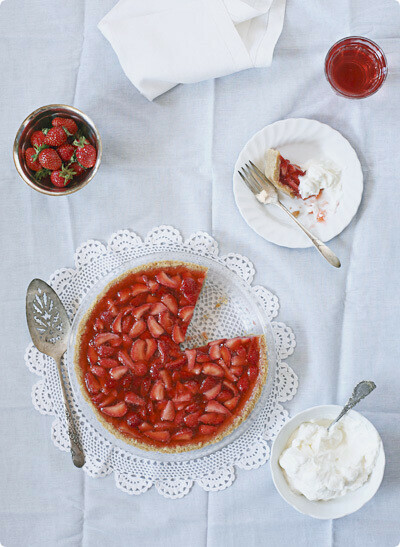 I’m sure I don’t need to tell you, but I will anyway: local strawberries are the only way to go for this pie. I don’t even want to think about what it would be like with those tasteless trucked-for-days interlopers, but surely nothing like the sweet, tangy, essence-of-summer bombshell it should be. Even if the season has come and gone where you are (and I realize there are plenty of places further south where it has), just stick a bookmark here and come back next spring. As for the rest of you, what are you still doing reading this? Get pie-making! p.s. Do note the lengthy chilling time for this pie. To serve it in the evening I’d start on it no later than late morning; if you want to serve it in the afternoon I’d whip it up the night before. Preheat your oven to 350°F/175°C. Pulse the cookies in a food processor to fine crumbs, then pulse in the sugar, butter and salt until combined. Press the crumb mixture evenly onto the bottom and sides of a 9-inch (23cm) pie dish. Bake until golden and fragrant, about 15-18 minutes. Transfer to a rack to cool. In a large bowl, toss the quartered strawberries with the sugar and lemon juice. Let stand, stirring occasionally, 45 minutes to an hour, until the berries have softened but before they start to turn mushy. Drain the berries in a sieve set over a large glass measuring cup. Add enough water to measure 2 cups (480ml). Taste the liquid: it should be lip-smackingly tart and sweet. If it needs either a little more sugar or lemon, add it now. Transfer the juice to a medium saucepan and return the berries to their bowl. Sprinkle the gelatin over the strawberry juice and let soften for one minute. Bring to a bare simmer over medium heat, stirring frequently, until the gelatin has dissolved (don’t boil or the gelatin’s setting power will be compromised). Meanwhile, prepare an ice bath in a large bowl or the sink. Dip the bottom of the saucepan into the ice water, and stir until the juice has cooled to room temperature, 3-4 minutes. Stir cooled juice back into berries, then transfer the berry bowl to the ice bath. Stir the berries frequently (and gently) until the mixture thickens and begins to mound, 20 to 30 minutes. Alternatively, refrigerate for about 2 hours, stirring occasionally, until the same thing happens. Spoon the filling into the crust (you may have a little more than will fit, in which case spoon into a bowl or ramekin and save for a cook’s treat). Chill until the filling is set, at least 4 hours. The pie is at its peak as soon as it’s firm, but it will stay in fine shape (in the fridge) for about 3 days, though the strawberries will soften progressively over time. Serve slices of the pie with plenty of vanilla-scented whipped cream. Lovely ode to lovely strawberries. Oh, this reads like poetry. Nothing left to do, but to make this. Thanks. Enjoyed reading this post a lot. It was really so artistic to give strawberries such a warm, poetic welcome. Amen, from your neighbor in the Netherlands! I nearly licked the screen, and I know what I’ll be buying at the market this weekend! I hear ya from over here in my corner of Germany. Long overdue this year, those little red nuggets. Great post. Love your writing and the pie looks sehr lecker..
My crust broke to pieces when I tried to transfer it to the cooling tray! Whoa. This is just too weird. Right before I read that post, I was reading the latest post on Remedial Eating. Need I even tell you which recipe she was raving about? I am going to take it as a sign that I really should be making this pie stat. I loved reading this post! It’s been the same tune weatherwise here in London, but we’ve been getting the occasional warmth and sun over the past few weeks. Local and tasty strawberries deserve all the attention, and impostors must be forgotten. This post was a lovely read and a beautiful tribute to strawberries. And I can say that this pie is just perfection. And I can say that with confidence because I made a very similar version last month (strawberry season is obviously earlier in Southern California). A pie that is both beautiful and completely delicious is a clear winner. Strawberries are absolutely my top 10 summer fruits. Just discovered your blog, and the layout is beautiful. Looking forward to reading more. I love this letter! I read it over twice. It’s just so adorable. Melissa, this is love! The strawberries at the fruit & vegetable stand down the street from me are amazing right now… can’t wait to try this! This sounds fantastic, although I’m surprised there isn’t a photo of the final product. I have to agree on the local strawberries though, for many years I was quite sure I detested strawberries until my better half made me eat some that were in season… I loved them. Thanks to her, I love strawberries and thanks to you… I have a great way of using them! Much appreciated.John.